For cost-saving or technical reasons (such as improved assembly),multiple circuit boards may be combined to form a “panel”. This panel is then produced just as a single large circuit board. A separation of the panel does not occur! Always clarify the panel design with your assembly partner; pay attention to fiducials marks or mounting holes! Use our panel configurator during online order: With just a few inputs, you can configure your multiplier panel. In addition, a full-scale preview of your pcb panel is displayed within the order process. No additional panel -drawing / -release is necessary. Standard: A damaged printed circuit board (according to E-test) is not removed from the panel, but marked (X-out). This must be taken into account for assembly. Special production: If you do not want an X-out, select "No X-out" in the PCB calculator. The Multi-CB technology hotline will assist you: +44 (0)1425 489 111. Multiple identical circuit board layouts are composed to form one panel. The completed panel is scored, or partially milled-out to provided the contained PCBs with bridges for breaking out. When designing the panel, please observe that a spacing of 0,0mm is left between the circuit boards. If a spacing between the (scored) PCBs is required, please leave a gap of min. 5,0mm. The contour line thickness should be 0,01mm / 1 mil. Because of the tolerances when breaking out the single circuit boards, all conductor traces and copper areas should have a spacing of at least 500µm from the scoring edge (see scoring). We recommend using scoring technology only for panels with a circuit board thickness of at least 1mm (stability). Multiplier panel scored – design advice as PDF. When designing the panel, please observe that a spacing of 2,0mm is left between the circuit boards. 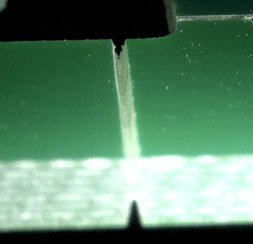 All conductor traces and copper areas should have a spacing of at least 200µm from the milling edge. If no bridges are defined by the customer, these will be inserted by Multi CB! Optimum width for the bridges: 1,0 - 1,5mm. Multiplier panel milled – design advice as PDF. For complex panels, multiple different circuit board layouts can be composed onto one panel. 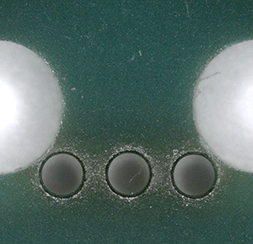 The completed panel is scored, or partially milled, to provided the contained PCBs with bridges for breaking out. The contour line thickness should be 0.01mm / 1 mil. 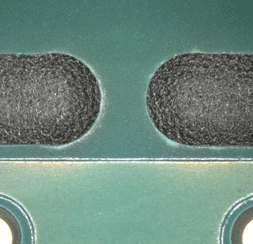 Because of the tolerances when breaking out the individual circuit boards, all conductor traces and copper areas should have a spacing of at least 500µm from the scoring edge (see scoring). We recommend using scoring technology only for panels with a circuit board thickness of at least 1,0mm (stability). Mixed multiplier panel scored – design advice as PDF. When designing the panel, please observe that a spacing of 2,0mm is left between the circuit boards. For reasons of stability, a distance of 10mm is usually recommended. If no bridges are defined by the customer, these will be inserted by Multi CB Optimum width for the bridges: 1,0 to 1,5mm. Mixed multiplier panel milled – design advice as PDF. When designing the panel, please observe that a spacing of 0,0mm is calculated between scored parts, and preferably 2,0mm between milled parts. All conductor traces and copper areas should have a spacing of at least 500µm from the scoring edge, and at least 200µm from the milling edge! Example for milling - scoring combination as PDF.